A powerful truth, which may or may not have been a historical event. This weekend is the celebration of the Epiphany. The readings can be found here. The journey of the Magi is one of the most beautiful stories in the Bible. 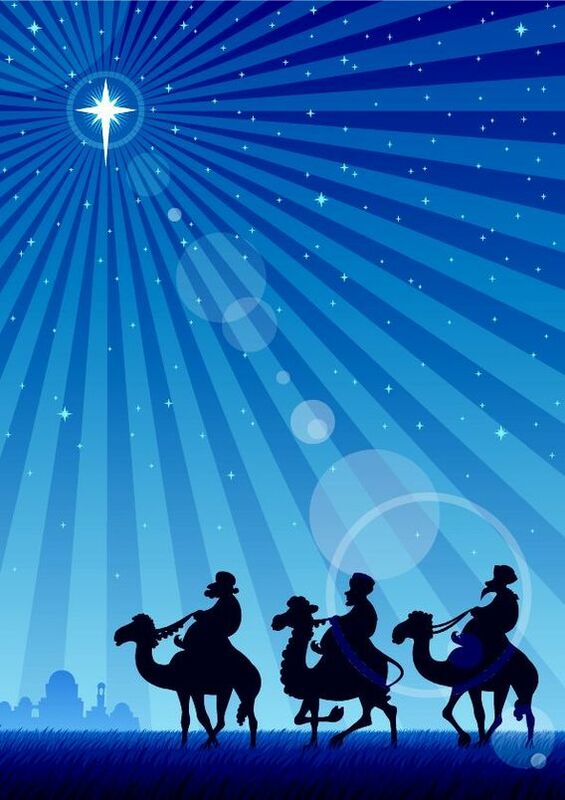 Mysterious foreigners receive a cosmic sign to leave their home and pay homage to the newborn son of God. The imagery describes the mystery of the cosmos and the message that Christ has come for all people. It is a fitting end to the “twelve days of Christmas”. In the Eastern Orthodox Church the Epiphany is a bigger celebration than the Feast of the Nativity on December 25. A few years ago the American Atheists spent money on a billboard with the tagline “You Know It’s a Myth” with the picture of the wise men traveling to visit the infant Jesus. I found this very odd on a number levels. I believe the point they were trying to make is that if the story of the Magi found in Chapter 2 of Matthew is not a historical event, then it is not “true”. In that sense American Atheists are showing their epistemological kinship with Christian fundamentalists in that both groups believe in biblical literalism. Catholics believe the Word of God is much richer than the literalists do. Catholic teaching states that the Bible conveys eternal truths through a variety of literary genres. These truths can be in the form of describing historical events (such as the Resurrection) or theological reflections (such as many of the parables that Jesus told). At the end of this lengthy chapter, the question arises: how are we to understand all this? Are we dealing with history that actually took place, or is it . . . a theological meditation, presented under the guise of stories? In this regard, Jean Daniélou rightly observes: “The adoration of the Magi, unlike the story of the annunciation [to Mary], does not touch upon any essential aspect of our faith. No foundations would be shaken if it were simply an invention of Matthew’s based on a theological idea” (The Infancy Narratives, p. 95). Pope Benedict XVI (2012-11-21). Jesus of Nazareth: The Infancy Narratives (p. 118). The Doubleday Religious Publishing Group. Kindle Edition. Pope Benedict XVI (2012-11-21). Jesus of Nazareth: The Infancy Narratives (Kindle Locations 1165-1170). The Doubleday Religious Publishing Group. Kindle Edition. “This wonderful tale of three astrologers scouring the heavens for signs of new happenings on the planet captures the imagination of every generation. You see, we humans are meaning-making creatures eternally searching for the Mystery at the heart of the universe that dignifies and enchants our lives. Human beings just can’t help trying to understanding the meaning of it all. We are constantly trying to understand the how and the why of existence. There’s this thing that some people call Scientism afoot that threatens our ability to see beyond our noses. Scientism is the religion of those scientists who refuse to concede that the phrase, “I don’t know” is sometimes the only answer that we have. Scientism is science that slips into an ideology of materialism—an ideology of materialism is the idea that every thing and every body is nothing more than the random collision of atoms and molecules. Scientism is the assertion that we and the universe are nothing more than a cosmic fluke of enormous proportions going nowhere in particular. According to the dictates of scientism: any meaning that we might attribute to our existence is therefore just that—our own arbitrarily generated attributions of purpose to a journey to what is at the end of the day nothing more than the purposeless march of time. Unlike science, that provides for the possibility of a creator, scientism would have us believe, that there is no meaning behind our existence, we simply randomly evolved and we will someday randomly devolve, or dissolve into a pile of dust. Unlike our ancestors, we live in a culture in desperate need of enchantment and awe. We are so meaning-starved as citizens of the Western world in the 21st century that we chase after almost any kind of novel spiritual movement. The pendulum swings from scientific materialism to the latest cult so starved are we for spiritual re-enchantment. In our state of spiritual hunger we’ll accept any morsel from the smorgasbord of new age spirituality. The theory of allurement isn’t confined to astronomy, it dips into to theology and from the priest come palaeontologist, Pierre Teilhard de Chardin, it borrows the notion of the Omega Point. The Omega Point is the completion and perfection of all creation to which we are being drawn, no-coercively, gently, and in a way that respects our freedom. How do we find our way to the Omega Point? Well that’s the real beauty of this theory, you see it’s described as a completely natural process that kicks in the moment we decide to trust this Power—this power that goes by many names, you and I are bold enough to call this power God, some call it Wisdom, but there are other names. The point of the Omega Point, is that all we must do is to follow the way of the Magi and look for the light. Physicists call this quest for the light, “attending to our allurement”. The dynamic of allurement is a powerful force in the psychological make-up of the human being. This entry was posted in Sunday Reflections and tagged Bible, biblical literalism, Catholic, Christ, Christian, Cosmic Christ, Dawn Hutchings, Divine Milieu, Ephiphany, fundamentalism, Gospel of Luke, Gospel of Matthew, Holy Cross Lutheran Church, Infancy Narratives, Jean Daniélou, Jesuit, Jesus, Joseph Ratzinger, literalism, Luke, Magi, Matthew, myth, mythic truths, Noosphere, Omega Point, Pastor Dawn Hutchings, Pierre Teilhard de Chardin, Pope Benedict, Pope Benedict XVI, Raymond Brown, Raymond E. Brown, Sunday Readings, Sunday Reflections, teilhard, teilhard de chardin, The Divine Milieu, The Omega Point, Three Wise Men, truth, wisdom stories, Wise Men. Bookmark the permalink. I copy this from your 2nd to last paragraph not so unlike my posting of yesterday, Consider the Stars. This is a very good thinking piece my friend. By the way posting at one something in the morning? “Christ is the ever-present light of our lives, beckoning from the many stars that allure us, calling us toward our own divine image and inspiring us to give our lives as an offering so that all of creation may continue to evolve”. William, an excellent reflection on the Feast of the Epiphany. Following that light can lead us to unexpected and untrodden paths that put us in the way of the Herods of this world. Thanks for re-posting. I needed that reminder and encouragement to remain steadfast in following the light. I agree that this is an excellent reflection on the Feast of the Epiphany. God is calling us to be like the Magi but we must also be prepared to encounter Herod who lurks within and around us.